Lycksalighetens ö (The Isle of Bliss) (1945) - opera in four acts. By happy coincidence I happened to hear the Symphony Orchestra of the Norrlands Opera in concert just a couple of days before I listened to this recording. At this concert they played, Beethoven�s Leonora Overture No. 3, Stravinsky�s Symphony in C and Britten�s Serenade for Tenor, Horn and Strings. The Stravinsky and the Britten were composed at roughly the same time Rosenberg wrote The Isle of Bliss. I was prepared for the excellent playing, which came as no surprise. I had heard the orchestra before, under their then principal conductor, Kristjan Järvi, younger son of Neeme Järvi and brother of Paavo, once sharing the leadership of the Stockholm Philharmonic Orchestra, nowadays head of the Cincinnati Symphony. What was a surprise, though, was the opera. Of course I knew of its existence but I had never heard it. Well I had heard the final scene on a disc of excerpts from Swedish 20th century operas based on literary classics. That was a Caprice release in the early 1980s. The power, the inventiveness, the sheer beauty and the melodiousness of this opera was something of a revelation. 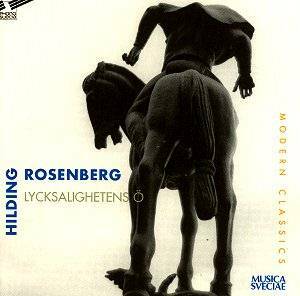 Hilding Rosenberg belonged to the first generation of modernists in Swedish music. The premiere of his first string quartet in 1923 has gone down in the annals of Swedish music history through the infamous review by Wilhem Peterson-Berger, who wrote about "impotence, torture, insanity and dazed fantasy". Towards the end of the 1930s Rosenberg wrote several works in a more accessible neo-classicist vein, among them a ballet, Orfeus i sta�n (Orpheus in Town). There Carl Milles� famous Orpheus statue, erected in front of the Concert Hall at Haymarket in Stockholm in 1936, roams the town looking for Euridice and visits fascionable nightclubs. There he dances the tango and other popular dances of the day. A concert suite from Orfeus i sta�n is rather popular. Lately the complete ballet has been recorded in the Musica Sveciae series. By the way, all the covers in the series are sculptures by Carl Milles (1875 � 1955). The opera Lycksalighetens ö (The Isle of Bliss) is based on a fairy play by one of the most important romantic Swedish authors, Per Daniel Amadeus Atterbom. The original play, written in 1824, is 800 pages long. Rosenberg condensed it and the present version is further cut. Rosenberg had seen the fairy play in 1929�1930, when he wrote incidental music for a production by the Radio Theatre. However the only music that was recycled into the opera was Felicia�s song (CD 2 track 1) and the Nightingale�s song both in act III. Astolf is the king of the Hyperboreans, the wintry land close to the North Pole. He goes astray to the the Cave of the Winds where the West Wind (Zephyr) sings about immortality in the Isle of Bliss. Astolf asks Zephyr to fly him there. He meets queen Felicia, they fall in love and he stays there for three centuries. Finally Felicia allows him to go back to earth again, where Astolf dies, but Zephyr sings: By Time are all things overcome, his spirit chills. Yet in saga and in song shall ever live the dream of the Isle of Bliss! The text is rather out of phase with time during the war years. It could be regarded as escapism. Rosenberg has here created what the noted critic and author of several books about opera Folke H Törnblom has called an opera "amongst the most remarkable that has been created in Swedish opera production". Today there is a steady flow of phantasy literature and films, often based on ancient myths. Now might just fine this work back in phase. Admirers of The Lord of the Rings should give it a try! The opera was premiered at the Royal Opera in Stockholm on February 1st, 1945, conducted by Herbert Sandberg. Einar Beyron took the role of Astolf, his real life wife Brita Herzberg as Felicia and Hjördis Schymberg was Zephyr. The sets were by the noted expressionist painter Isaac Grünewald, whose name is possibly known to visitors to the Stockholm Concert Hall, where the chamber music hall is named after and decorated by him. It was later staged again in 1962 with Stig Westerberg conducting. It was performed between 1945 and 1963 no less than 35 times, making it one of the most successful Swedish operas. In 2002 the Norrlands Opera in Umeå in the north of Sweden (well, fairly north, still far from the Arctic region where Astolf�s kingdom was situated) gave 12 performances to great acclaim. The present recording was taped during four of these. Rosenberg was no newcomer to opera. Both Resa till Amerika (Going to America or Journey to America) (1932) and Marionetter (Marionettes) (1939) had had some success. Later he wrote Kaspers fettisdag (Punch�s Shrove Tuesday) (1954) � based on Strindberg; Porträttet (The Portrait) (1956) � based on Gogol, both for Swedish Radio, and finally Hus med dubbel ingång (House with double entrance)(1970) � after Calderón. Moreover he composed an opera-oratorio in four parts, Josef och hans bröder (Joseph and his Brethren) (1945 � 1948), after Thomas Mann�s novel cycle. This shows that Rosenberg had a more than passing interest in music drama. Here, in The Isle of Bliss, he is a fully-fledged dramatist, having adjusted his tone language to the requirements of the texts. He presents a large-scale canvas, deeply rooted in the romantic tradition with minor keys a predominant feature. Nordic folk song runs through the score, which is in four acts, divided into twelve tableaux. Straight from the opening, when the listener is thrown immediately into the action, without an overture, Rosenberg catches the attention and never loosens the grip. A cold wind is blowing, we hear gun-shots, some hunters appear and soon there is a very atmospheric Huntsmen�s Chorus. Astolf makes his entrance in the second tableau (CD1 track 2), blowing his horn and finding that he�s gone astray. He sings an almost italianate aria; it could have been written by Puccini! He is accompanied by a very active orchestra, commenting, underlining and towards the end whipping up a real frenzy, helped by a wordless chorus. In the third tableau (CD1 track 3) we hear a lively children�s chorus. The East Wind enters followed by the North Wind and then the South Wind; all of them with seven companions. We are treated to a ballet sequence of orgiastic dimensions, especially when they begin wrestling. Not even Stravinsky or Prokofiev would have been ashamed of this music. The Chorus of Winds, concluding the first act: Up through the air, away o�er the seas is short but masterly. The second act (CD1 track 4) starts lyrically in the park of the Isle of Bliss, with a transparently scored orchestral prelude � strings, harp and a capricious flute. This is weightless music and when the Nymphs enter, singing and dancing, we are immersed in the fairy tale. Act III opens with wild, rhythmically alert music, depicting Astolf�s dream, with chorus. Peter Kadiev�s powerful bass-baritone sings the role of Time (CD2 track 1). There are some orientalisms when Nyx arrives and in act IV when Astolf returns to Earth. There is a fine harvest song sung by some country-folk (CD2 track 3). In the third tableau of this act (CD2 track 5) the contrapuntal orchestral introduction is followed by a drinking chorus worthy of Verdi. As mentioned before, the whole opera ends enchantingly with Zephyr and Choir. Rosenberg knows how to handle large orchestral and choral forces and he does it economically: everything belongs organically to the whole and the action always moves on. There is not a scene here that outstays its welcome. Playing and singing is of the highest order and Kristjan Järvi has a firm grip on the proceedings. Like his father he is not one to dawdle and indulge in introspection. It is difficult to imagine this work better done. That also goes for the solo singing. The Norrlands Opera have chosen young, fresh singers at the beginning of their careers, some of them taking their first professional role. The roles of Astolf and Felicia were written for and premiered by two of the most renowned singers at the Royal Opera in the forties: Einar Beyron and Brita Hertzberg. They were the reigning Tristan and Isolde at the time. Incidentally their daughter, Catarina Ligendza, was a leading Isolde internationally in the 1970s. Young Patrik Forsman does not possess the Helden-tenor�s shining steel but in the smaller house of the Norrlands Opera he can still ride the orchestra. Even if he presses a little too hard once or twice this remains a very fine interpretation. His voice not dissimilar in timbre and delivery to that of the young Gösta Winbergh; high praise indeed. The aria ending I must needs even see the Isle of Bliss ... (CD1 near then end of track 3) is unabashedly romantic with lush strings. Forsman makes the most of it. Felicia doesn�t have an Isolde-voice but Agneta Eichenholz has a gloriously lyric instrument, rounded, creamy. She immediately won me over in her first aria Eyes! Who is more lovely (CD1 track 5). More wonderful singing is to come: the closing scene of act II, for instance (CD1 track 6). The short but hauntingly beautiful love duet with Astolf is accompanied by seductive, almost Mantovanian strings. The end is magical. Her aria in act III tableau II (CD2 track 2) is also very beautiful. Yes, indeed, who is more lovely? Maybe Lisa Gustafsson�s Zephyr. The creator of the part was Hjördis Schymberg, Jussi Björling�s favourite partner at his many guest appearances at the Royal Opera. She was a notable Gilda, Violetta and Queen of the Night. While the lighter-of-voice Lisa Gustafsson is more of a Pamina or a Blonde instead of Schymberg�s Konstanze in Die Entführung, she sounds ideally cast as Zephyr. In the long tableau III of act I (CD1 track 3) she has a lovely aria, lightly scored with harp and high strings. In my notes I marked it with two exclamation marks, which I don�t do very often. She displays her lovely voice in act II tableau I (CD1 track 4) in the aria Say, Astolf, haven�t I kept my word? There she rises into the highest realms of the soprano range, and also in the third tableau of the same act (CD1 track 6) where she has a gently rocking folksong-like solo. Anna Axelsson (the Nightingale) is another light and high lyrical soprano singing beautiful cantilenas. At the other extreme of the female voice, Susanna Levonen�s full deep contralto is impressive as Anemotis, the Mother of the Winds (CD1 track 3). Overall the solo singing is very confident and contributes to the positive impression made by the music. Since this is a live recording there are some stage noises. They do not detract much from the listening experience. The general sound quality is excellent with good balance between voices and orchestra. As always with Musica Sveciae productions the disc is well documented with a substantial booklet in Swedish and English. The English translations of Sofia Nyblom�s commentaries are by Neil Betteridge and Paul Britten Austin. The booklet is also lavishly illustrated with photos from both the original production in 1945 and from the Norrlands Opera. I could have wished a more liberal approach to tracking to make it easier to find certain "arias". As it is there is only one track per tableau, and some of these are quite long (CD1 track 3 plays for 19:53). That is the only complaint I have. This has been one of the strongest opera experiences (live or on records) I have had for a very long time. I wish someone would mount a production of The Isle of Bliss again ... and soon. Maybe the Norrlands Opera could be tempted to do this by popular demand? In the meantime this set is a worthy substitute. Afraid of 20th century opera? No need to be � this is highly approachable music and any lover of late-romantic opera will feel at home. Afraid of the language? No need to be � Swedish is a highly singable language and the translations are excellent and easy to follow. This is my Recording of the Month. I recommend it with the highest possible enthusiasm.